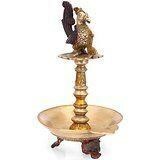 Brass Diya or Diyas at home that is considered highly fortunate and it brings wealth and good health. Bird Diyas are also lighted in Hinduism to purify their houses and heart. Akhand Jyoti or Akhand Deep brings pleasure and wealth for the worshipper. It is very unfavorable to cease the burning Jyoti. If this happens than light Diya and do pooja again. It serves for both decorative and prayer purpose. Moreover, this is a great gifting option for any occasion.Size : 9 Inches Height X 6.2 Inches wide X 5 Inches depth. Weight : 1.4 Kg ,Material : Brass. ----------------------------------- Pls beware from Copy product & ensure buying authentic product. This is exclusive inhouse design & product of Brand "Collectible India" and "covered by intellectual property rights laws". 'Collectible India' doesn t authorize any other Brand/Seller to sell it and we won't be responsible if any counterfeit or substandard product send by any other seller.